Hal Jorden gave me this idea to make a thread. I want to know the number of ways in which Batman could take out Goku. So...lets here it. Batman kills goku while Goku grunts like a constipated idiot. "Batman kills goku while Goku grunts like a constipated idiot." He slaps him every time he grunts forcing Goku to start over and repeats for all eternity. "Come on guys, lets be serious. Lets try and find some fun ways Batman can try to out Goku. XD"
He can take a knife, stab Goku in the heart, and send those blasted Dragon Balls to the Earth's core so those idiots will stop reviving him! I mean, come on! 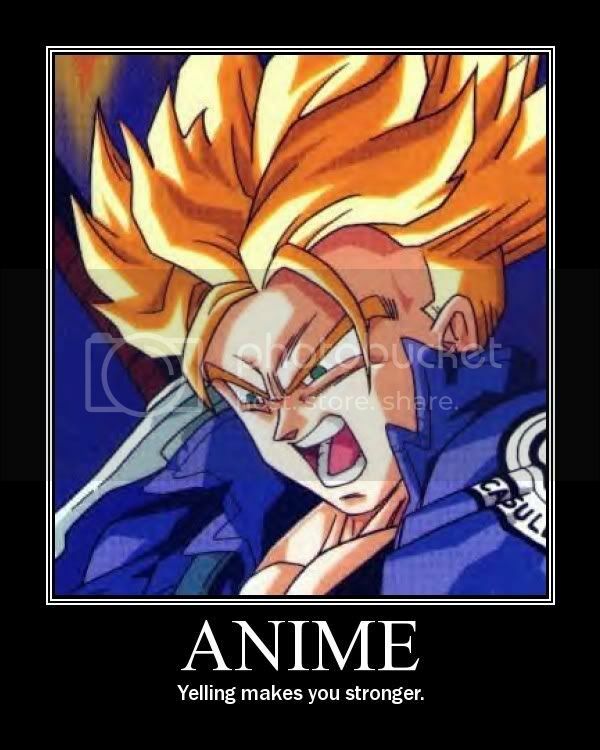 He dies in every episode of Dragonball! I have something to say to you, Goku, if you have so much power, you should be able to kill your enemies before they can kill you! one hit and batman is dead goku wins very very very very very very very very very very very very very very very very very very very very very very very very very very very very very very very very very very very very very very very very easy kill, worst fight ever losers!!! batman keeps giving Goku food that his high in sugar and saturated fat, thus giving him diabetes. Batman then steals his insulin to give Goku a slow death. Bats might also try to give goku a heart attack, if taking insulin starts to get boring. I hate threads like this.Everyone knows Goku wins...but somehow people are going to bother to say Batman has a chance. "I hate threads like this.Everyone knows Goku wins...but somehow people are going to bother to say Batman has a chance." Thats because we all know Goku will just sit there and grunt all day and the slightest distraction forces him to start all over. Thats because we all know Goku will just sit there and grunt all day and the slightest distraction forces him to start all over." No that's because people don't realize that Goku wasting time with screaming,talking,or grunting is Akira Toriyama's way of saying...."I'm too stupid to figure out another way to waste time and keep up the suspense of what is going to happen." No that's because people don't realize that Goku wasting time with screaming,talking,or grunting is Akira Toriyama's way of saying...."I'm too stupid to figure out another way to waste time and keep up the suspense of what is going to happen."" Still canon, so he will still do it, and will lose to all, including the Slowskys turtles. Still canon, so he will still do it, and will lose to all, including the Slowskys turtles." He doesn't always do it so that point is moot. Imagine if goku was constipated, imagine how long it would take for him to finish grunting. Lets ask our selves, who would you hang out with for just one day. Goku or batman? Lets ask our selves, who would you hang out with for just one day. Goku or batman?" So is goku from the constant winnings from his previous tournaments. And the free for all stuff these guys can get from the richest woman in the world XD also, what makes you think Bats would even give you any money? XD"
He's not as rich as Bats. He's not as rich as Bats." And bats aint' as rich as Bulma. And bats aint' as rich as Bulma." How much money does she have then? "How much money does she have then?" unlimited isn't a real figure.She looks broke to me. unlimited isn't a real figure.She looks broke to me." Not when her grandfather has a hobby of building a space ship for fun in his backyard....and other various knick knacks. Not when her grandfather has a hobby of building a space ship for fun in his backyard. " But there is no mention of their currency or how much the Briefs make on Capsule Co. But there is no mention of their currency or how much the Briefs make on Capsule Co."
Not really worth mentioning when the capsul corp has been going on for more than 28 years. And 28 years is how old Bulma is at the end of the Buu saga. During the first chapters of dragon ball, Bulma was introduced and she was already rich with a father who runs a successful company. So....since then 11 years have passed. From a rich company from the very beginning, it can be safely assumed her company grew. Especially since the Hoi Poi capsules were invented by her father, which everyone uses....and is considered an every day item around the world, making her the richest woman in the world. You can't compare...something to nothing. "You can't compare...something to nothing." what am i comparing it to? I'm just saying that the product Bulma's father invented became used all over the world. And the money went to the Capsule co-operation. Note the name..."capsule" Co-operation. what am i comparing it to? I'm just saying that the product Bulma's father invented became used all over the world. And the money went to the Capsule co-operation. Note the name..."capsule" Co-operation. " You comparing a fortune that isn't calculated to one that is. You comparing a fortune that isn't calculated to one that is." Didn't you get the memo? it's dragon ball XD"
He slaps him every time he grunts forcing Goku to start over and repeats for all eternity." Perfect cell managed to do something anti dbz fan has done. I hate Goku just as the next. I killed him, but he still came back just to make a fool or me and Frieza. My hatred burns with a passion. "I hate Goku just as the next. I killed him, but he still came back just to make a fool or me and Frieza. My hatred burns with a passion. " whats this saint Goku is that another form O_O?